Scientific Nature of the Whammy: Win $1000 worth of brand new cookware! 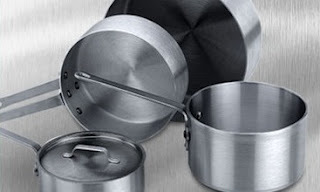 The good folks over at Food Service Warehouse are giving away a fabulous set of cookware. If you're not a big cooker, winning this set would certainly give you the bump you need to start enjoying your kitchen again! The best part (for me haha) is that if you win, I WIN! They're actually giving away two sets, one to a winner and one to the site that winner was referred from! I've got a button up on my sidebar, and winners will be announced in mid-April! If I win, I'll surprise my husband with it since he's the one who does most of the cooking around here and I know he'd love it. You could keep it for yourself, or give it as a gift... or a combination of both!